HOW LONG DOES THE NEWBORN SESSION LAST? WILL I BE ABLE TO BE IN THE PHOTOS WITH MY BABY? CAN YOU TELL ME ABOUT YOUR DESTINATION MATERNITY SESSIONS? CAN WE TAKE PHOTOS OR VIDEO DURING THE SESSION? HOW DOES THE SESSION RETAINER + COLLECTIONS + DIGITAL IMAGES WORK? CAN I SUBMIT MY DIGITAL IMAGES TO BABY CONTESTS? CAN I BRING A FRIEND OR FAMILY MEMBER TO THE SESSION? DO YOU REQUIRE A DEPOSIT OR SESSION FEE? We only book a select number of newborn sessions each month, and our calendar fills up quickly. We recommend you contact us to secure your spot on our calendar when you’re around 20-weeks. Signature Newborn sessions typically last between 2-3 hours, depending on how often your baby needs to eat. We kindly ask that you refrain from scheduling other appointments on the same day as your newborn session, so we are able to take our time in creating beautiful images for you. The Petite Newborn sessions last 30 minutes-1 hour. The Signature Newborn session includes Parents, Baby and Siblings. Although you are not required to be in the session, we highly encourage parents to participate and allow us to capture a family portrait. The Petite Newborn session includes Baby only. We have an extensive collection of over 100 high-end maternity gowns, robes, and separates, custom designed to accentuate your growing belly. Our collection includes gowns in sizes XS through XXL. We will discuss wardrobe during your planning consultation. Arizona is a gorgeous state, and we LOVE to travel! We’ve captured maternity sessions all across the Valley, in Sedona, Flagstaff and Tucson. Because each destination is unique, please contact us (link to contact page) directly to discuss options and locations. We do love to see behind the scenes images, but we ask that you leave the baby portraits to us. Instead, relax and enjoy the session! Great question! Your session retainer is paid at the time of booking, and secures your spot on our calendar. After the session, you have the option to choose a Portrait Collection, or Digital Images Only Collection. Additional products are available A la Carte as well. Yes! All of our collections offer digital image options, or you can opt to purchase just the digital images on their own. No. All images are copyright to Lizzy McMillan, Momento Studios, LLC and are for personal use only. We ask that only individuals that will be photographed attend the session. A Session Retainer is required to schedule your session. You can view the list of Session Retainers here. Session retainers are non-refundable should you cancel. If you need to reschedule, the session retainer will be applied to the future session. I have been working as a newborn photographer since 2003 when I worked for a large children’s photography studio. In 2004 I earned my Certified Professional Children’s Photographer distinction with the company, after completing an intensive 4-month training process, exam and portfolio review. I started my own photography company in 2006, and in 2014 I opened my first commercial photography studio, located in Downtown Mesa, Arizona. As of February 2018, I have photographed over 1800 newborns, including 90 sets of twins, 9 sets of triplets, 4 sets of quadruplets and 2 sets of quintuplets. My extensive work with multiples has attributed to my reputation as the newborn photography industry’s leading authority and educator for newborn twin photography. Yes- extensive training! When I began photographing newborns, it was for a corporate children’s photography studio. We were required to go through an intensive training program before we were ever allowed to handle or photograph children. Additionally, when I decided to branch out and begin my own company I began attending the WPPI and IMAGINGUSA photography conferences to further my education. I have attended several in-person classes that specifically focused on newborn and child photography safety and posing with Stephanie Robin, Sandy Puc’, Sarah Petty, Michele Celantano, Rachel Vanoven, and private mentoring with both Amber Maness and Ana Brandt. As your newborn photographer, I have a commitment to you and your baby. I am 100% committed to ensuring that your baby is safe and well cared for in a professional and clean studio. I will never compromise safety to capture an image. Your baby’s safety and well being is infinitely more important to me than any portrait. I wear the title of “germaphobe” with honor. The truth is, I value sterilization and cleanliness in the studio, because I am aware that even the tiniest germs can have a big impact on your baby. Every fabric that is used during your session has been freshly laundered in a dye-free, fragrance-free, hypoallergenic detergent. This includes any outfits, wraps, backdrop fabrics, blankets, and even the changing pad and hand towels we use while you are in the studio. We put a fresh cover on the changing pad, and add fresh hand towels to the restroom (we also have disposable hand towels in the restroom). We pull two warm blankets from the studio closet- I use these during the session to keep baby warm and happy (and to avoid soiling any blankets you may bring). We use Clorox Bleach wipes to disinfect the parent lounge seating area, as well as the couches and chairs in the newborn camera room. I sweep the floor, and ensure the temperature in the room is correct for your baby’s comfort. We add fresh water to the Keurig coffee machine, and ensure that cups and snacks are readily available. Surfaces in the Parent Lounge are dusted, and tidied. Any debris or garbage is removed prior to your arrival. The toilet, sink and bathroom mirror are cleaned and sanitized. Feminine products are restocked if needed. Props and fabrics are selected, inspected, and paired/laid out for your approval. ALL fabrics, wraps, outfits and blankets used during the session are collected and taken home to be laundered and sanitized. During your session there are three elements that I am consistently monitoring. Warmth: Babies prefer to be cozy and warm. Many of the poses are done with minimal or no clothing, so I use a space heater to keep the newborn camera room at a comfortable temperature for your baby (between 80-85 degrees). Babies often have a difficult time regulating their body temperature, and can overheat quickly. Additionally, newborns are not born with a full set of sweat glands, so they can easily overheat. I am constantly monitoring your baby for signs of overheating, as well as being too cold. I keep warm receiving blankets in the studio, and utilize them to cover baby between poses. Circulation: The newborn circulatory system is not fully developed when they are first born. You have probably noticed that your baby’s hands and feet can change colors frequently, indicating poor circulation. This is not uncommon with newborns, and it is my job to monitor their hands, feet, and lips/mouth for proper circulation in every pose. Breathing: Positional asphyxiation is a risk with inexperienced posing. As an experienced newborn photographer, I pose your baby in comfortable positions that do not impair their breathing. I listen closely to your newborn’s breathing throughout our entire session. Whether baby is in a prop, or pose on the beanbag, I pay close attention to ensure their respiration does not sound strained, labored or abnormal. I monitor their chest and watch their nose and lips for any discoloration (which may indicate low oxygen levels). If there is any indication that your baby is in distress, I change the pose immediately. Every baby is different, and every baby has a different tolerance for comfort and posing. Absolutely. Without a doubt, any pose or position that appears to be upright will be photographed safely as a composite image, where hands are kept on the baby at all times. Additionally, I capture the “suspended” poses as a composite as well- so your baby will never be suspended or unsupported. Yes! I do work with a trained posing assistant, as I believe it is helpful throughout the session for workflow and safety. I feel that working with a trained assistant enhances your experience as a client as well. You are able to watch the newborn photography session and relax, knowing that your baby is safe in each pose and position as I document their portraits. You are also invited to enjoy in the Parent Lounge as well (many new parents take a nap in the recliners, or catch up on a show). If you would prefer to spot your baby during a session (instead of my trained assistant) I would allow you to do so. For myself: I will NEVER photograph a newborn in the event that I am under the weather personally. This is an absolute non-negotiable for me, as I am aware of how delicate your baby’s developing immune system is. I often work with NICU graduates who have extremely sensitive immune systems. Your baby’s safety and health is 100% the most important component of your portrait session with me. This includes everything from a sore throat, common cold, and of course fevers or any other sickness. Although I suffer from seasonal allergies (thank goodness for Zyrtec!) I am generally a very healthy individual. In the event that I am ill, I will contact you immediately with several options (depending on the ailment). I will work with you to reschedule the session if necessary, and keep in contact with any health updates. I will also offer you the option of transferring your session to another photographer associate of mine, if that is your preference. I have an amazing network of professional newborn photographer associates who are equally as skilled that are on-call to be a back up for my clients in the event of my injury or illness. Because I have established this network, you will never be left scrambling to find a replacement. In nearly 15 years of working with newborns, I have had to reschedule less than a dozen sessions due to illness. *This is the same policy for my posing assistant- she is not allowed to be in the studio if she is ill.
For my children: I am a mommy to three children, who do get sick from time to time. My children are current on all vaccines, and are generally in good health as well. In the event that my children are ill with a common cold or allergies (yes, they have my seasonal allergies! ), I will update you accordingly. I feel it is your decision to keep the session as scheduled or to reschedule. I will not suggest that we keep your scheduled session unless I myself feel 100% well. My studio is not located in my home, and my children are not permitted in my studio when they are ill. I keep a full set of clothing in my studio (away from any germs that may be at home), and change clothing when I arrive. If my children have a more serious ailment or one that is highly contagious, I will contact you immediately to update you. While each situation is unique, I will discuss rescheduling options with you- in general I do not recommend we keep a scheduled session if there is a more serious illness in my home, even if I am not afflicted with the illness. Both my physician and my children’s pediatrician are aware that I work with newborns, and anytime there is illness in my family, I defer to the doctor’s recommendations, and openly share that information with my clients. For your children/spouse: Sick children (and adults) do not photograph well! If you have an older child, spouse or yourself that you want included in portraits and he or she is ill, has a fever or deep cough when you are scheduled for your newborn photography session (or any session with Momento Studios), we kindly ask that you reschedule. We will work with you to reschedule your session to make sure your family is healthy, happy and at their best for your portrait session. This wellness policy is two-fold: when your child is not feeling well, it shows in their behavior, and in the finished portraits (red/puffy eyes, runny nose etc.). Secondly, I have a responsibility to all of my clients and my family to maintain this wellness policy in the studio. This helps to ensure that I stay healthy as well, so I can best serve all of my clients and my own family. For the safety and health of all my clients, sick persons are not permitted in the studio. YES. YES. YES. I realize this can be a controversial subject, but I feel that as a professional photographer that has chosen to specialize in newborn and maternity photography, it is my responsibility to ensure that I am up to date on all the vaccines that are necessary and recommended for working with pregnant women and newborns. I had my antibody titer test completed in April 2016, which indicated that I needed a MMR booster to become fully “up to date”. I received the Tdap vaccine in 2010, 2013 and 2016 with each of my pregnancies. It is recommended that anyone working with newborns and pregnant women receive a Tdap booster every five years. The Tdap vaccine protects against Whooping Cough, which is extremely serious and often fatal in newborns. Lastly, at the advice of my doctor, my OBGYN, my children’s pediatrician, and the CDC, I also get the annual flu shot. The annual flu shot is released every year in August, and is recommended for everyone- especially individuals around newborns and pregnant women. While the vaccine is not guaranteed to be 100% effective, I do get the flu shot every year in mid-August. “Flu season” does not typically begin until late October, so I like to ensure that I have received the vaccine well ahead of flu season. 8. Can you point me toward online resources from which I can learn about safe practices when photographing newborns? Definitely. I am a Qualified Newborn Photographer (QNP) through the APNPI organization. 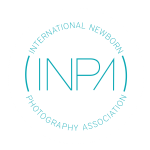 Additionally, due to my commitment and demonstration of newborn photography safety, I was asked to be an official Ambassador for APNPI as well. It is an honor to be recognized, and to be a regular contributor to the APNPI website. I am also one of only eight official Ambassadors for Stand In Baby, which is another organization committed to the education and safety practices for newborn photographers. I utilize the SIB posing dolls in the workshops I teach throughout the country and in 1:1 mentoring sessions with other photographers. Lastly, although Professional Photographers of America (PPA) is not specifically limited to newborn photography education, I have been an active PPA member for the past ten years. I am the only PPA Certified Professional Photographer (CPP) in the state of Arizona that specializes in newborn and maternity photography. If you have any questions, or would like to know more detailed specifics about my commitment to your newborn’s safety and health, please contact the studio. I would be thrilled to discuss any questions you have.